All-Edge Brownie Pan - Feels kinda wrong, tastes sooo right! This design has the notoriety of being the first of any post on this blog to cause my fiancee's jaw to drop, and remain dropped, for something on the order of 20 seconds. 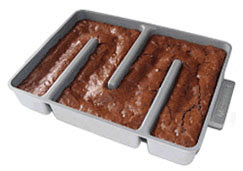 We both love the edge and corner pieces of brownies, bars, and blondies (which makes for a competitive situation whenever we bake), so the Baker's Edge all-edge baking pan is just... well, words are beginning to fail me. But you get the idea - all edge and corner pieces. Brilliant! Now, this being a use-and-usability design blog, I'm trying to find something to critique. Harder to clean? Maybe. Requires adjustment of cooking time? Probably. Some people don't like edges (like my fiancee's two friends who I also showed this to, receiving a lukewarm-at-best reception)? Apparently. Does something feel morally wrong, even slightly unholy, about an all-edge frankenbrownie? Kinda. I like the middle pieces.